Before industrial operations started in the 1960s, the Koshkar-Ata hollow was a periodic lake rich in natural salt, making it unsuitable for farming. The discovery of vast uranium deposits in the deserts of western Kazakhstan lead to the establishment and rapid development of a uranium extraction and processing industry. At its peak in the 1980s Kazakhstan was producing more than a third of Soviet uranium, with more than 30 uranium mines. 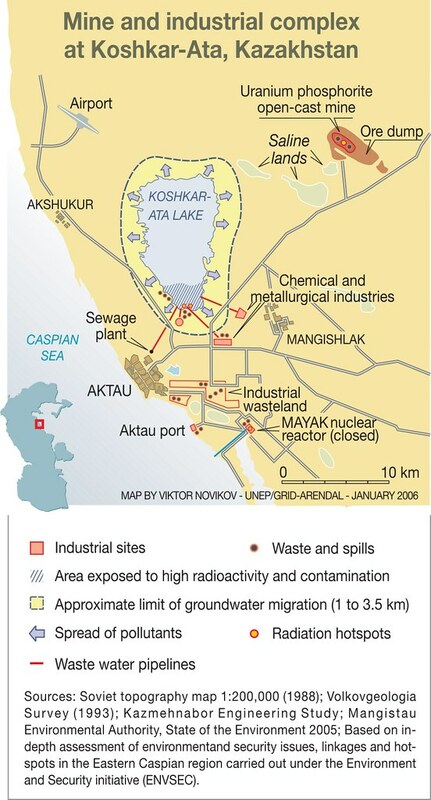 The Koshkar-Ata depression was chosen as a convenient location to accumulate radioactive and toxic waste from the chemical and hydrometallurgical complex in the newly founded city of Shevchenko (now Aktau, with about 176 000 inhabitants). The complex produced, among others, uranium concentrate mostly for Soviet military purposes. Falling prices on the uranium market due to changes in military priorities, gradually decreasing uranium concentrations in the mines and the overall economic crisis in the post-Soviet world of the 1990s led to reduced output and ultimately complete stoppage of uranium milling in 1999. The lake is still used as a dumping ground for commercial and production waste, oil extraction sludge, etc.